Springtime is strawberry season! And even though the strawberries aren’t quite there yet (the heavy rains we’ve had in California have really impacted the flavor), that hasn’t stopped me from buying and eating pounds of them — I’ve loved them since I was a baby. For your reading pleasure, below are 10 things you may not know about my favorite fruit. 1. Strawberries are grown in every state in the US, but 88% of the strawberries sold in the United States are grown in California. 2. The best strawberries come from Harry’s Berries, in Oxnard. Don’t believe me? My cousin works for Thomas Keller, and she told me that Chef Keller orders Harry’s Berries for his New York restaurant. 4. The best way to eat strawberries is straight out of the basket and slightly sun warmed until your fingers are stained pink from the juice. 5. The second best way to eat strawberries is dipped in creme fraiche and turbinado sugar. Strawberry shortcake and pavlova tie for third. 6. If you have some supermarket strawberries that are less than perfectly red and sweet, slice them up and toss them with a little balsamic vinegar and brown sugar. This enhances the color and the flavor. 7. The best way to store strawberries is in a sealed glass jar. They’ll last at room temperature for a couple of extra days, and in your refrigerator for over a week. However, though they maintain their texture and don’t spoil, the flavor does dissipate. 8. 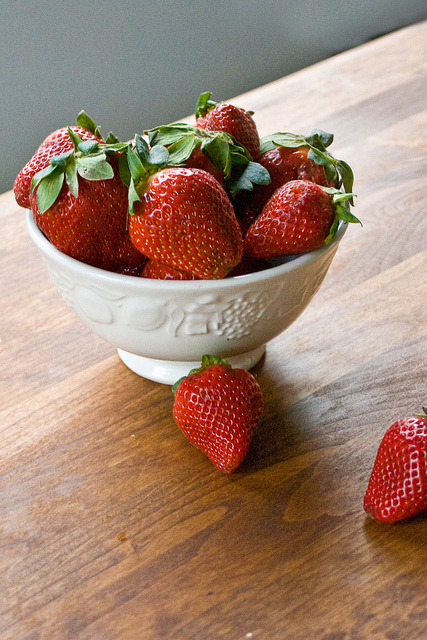 The fragrance and flavor of strawberries depends on a balance of acid and sweetness. When you cook strawberries, they yield a lot of juice, lose some color, and lose a lot of that acid which makes the flavor so balanced. Always add some acid in the form of lemon juice or vinegar when you’re cooking strawberries, but most of the best strawberry dishes use raw strawberries. 9. If your strawberries have mushy spots and you don’t really want to eat them, slice them up and throw them in a jar with some sugar and top with rum, vodka or brandy. The alcohol and sugar will preserve the berries in the refrigerator almost indefinitely, and the resulting concoction is fabulous over ice cream, yogurt, or eaten straight out of the jar with a spoon. 10. Homemade strawberry jam is absolutely divine. I like to add some balsamic vinegar to balance the sweetness (wrinkle your nose, but the flavors are so complementary you won’t even know it’s there) and a little black pepper for some floral warmth (the Italians eat strawberries with balsamic and black pepper. Try it!). 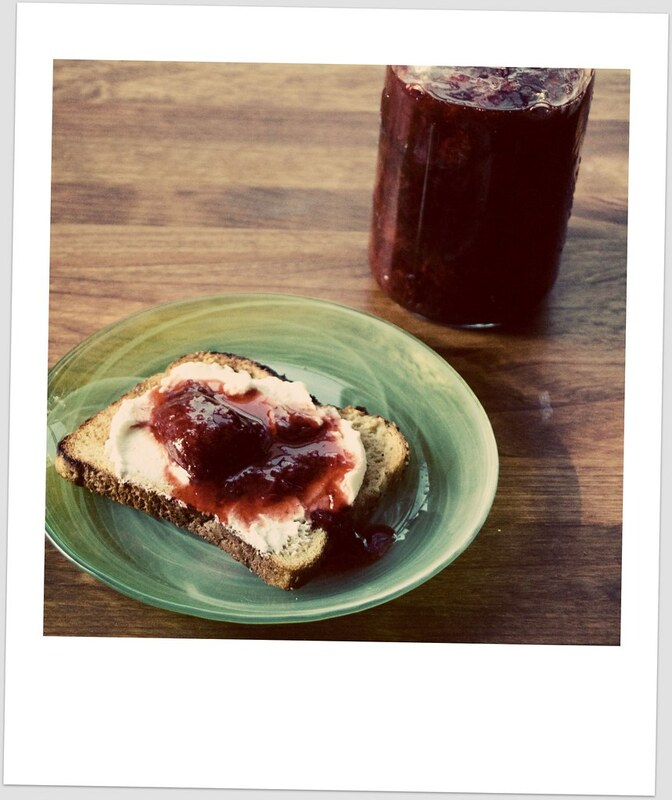 You also get that June Cleaver Americana satisfaction of putting up your own jam. I promise that you’ll never go back to Smucker’s again. Combine sugar and berries in a large pot and heat over a medium high flame, stirring frequently. Add pectin according to the package instructions. Skim off foam as it rises to the top. Test for set (after about 15-20 minutes) by dropping a spoonful on a cold dish and seeing if it holds together to your satisfaction -- I like a soft set, but others like a firmer set. If you like a very firm jam, you might want to use 2 packets of pectin. If it's not set, keep cooking and stirring, and test periodically until it is. When the jam has set, ladle into hot, sterilized jars. Leave ¼ inch space between the top of the jar and the lid. Close lids tightly, and process in a boiling water bath for 10 minutes. (Make sure the jars are completely submerged in the boiling water). Let cool, and remove rings for storage (if you remove the rings, you'll know if a jar has lost its seal and needs to be eaten immediately or thrown away. ) Jam is a pretty low-risk canning operation, due to all the sugar and the acid, both of which act as preservatives. I’ve never tried adding balsamic to my jam – love anticipating the added tang. Great recipe! this jam sounds lovely! i am excited to give it a whirl we we have some local berries! The berries are everywhere here! How many jars does this make? Half pints?